Looking SW over dig site from rubble mound. Digging to S of cottage. clearing back the vegetation across the site as a whole, ensuring safe access for our visitors – initial interest in the tour has been very high – so this is really important. Last Tuesday, Natural England and a team of conservation volunteers did a great job helping clear vegetation from the wider site. Looking E at extension against W part of S end of cottage. Friday, work continued on our 3x2m trench over the eastern part of the 1880(ish) ‘sort-of-lean-to-conservatory’ extension on the south end of the cottage, and the area beyond it where a well may have been. It has been slower work than expected for it has been badly damaged by military ordnance and the later bulldozer that ‘tidied up’ afterwards. 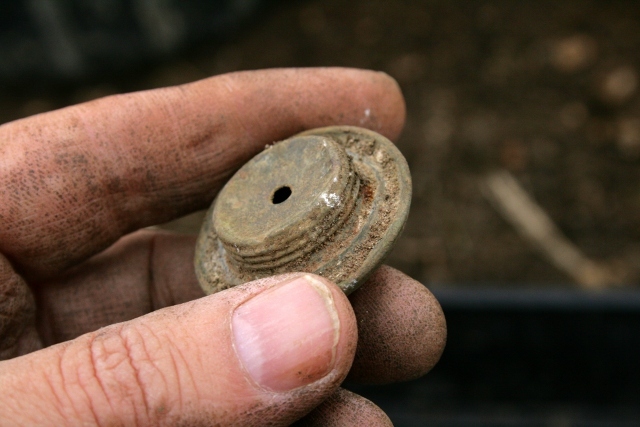 The relative absence of our usual rusty nails is strong evidence for the bulldozer having pushed all the window and roof timbers – to which the nails would have been attached – across the site, from west to east and they would have been added to the large demolition rubble mound on the east side of the site. Looking E at S wall of cottage extension. 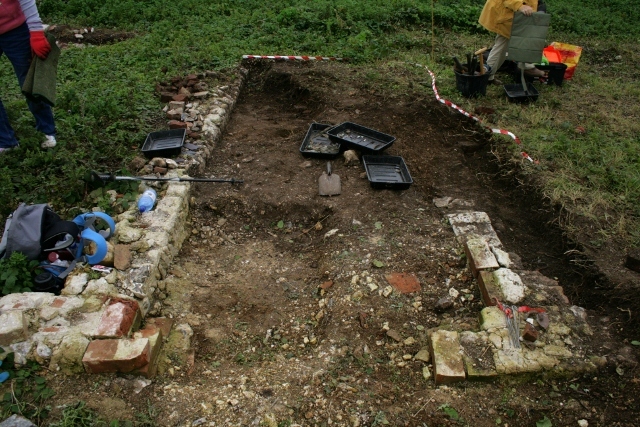 The south wall of the extension, over a distance of about 3m, has lost 3 courses of bricks to the bulldozer. 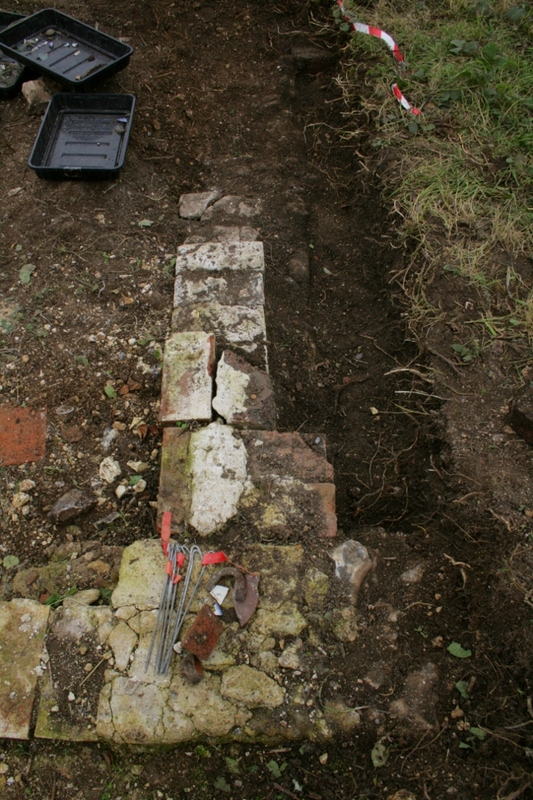 Its line gets weaker the further east that it goes, as it heads towards the expected turn of this wall back towards the south wall of the cottage, which has slowed down the progress of its excavation. The ground surface outside, to the south, of this wall is a light, humic, garden soil, with no sign of demolition rubble above it. 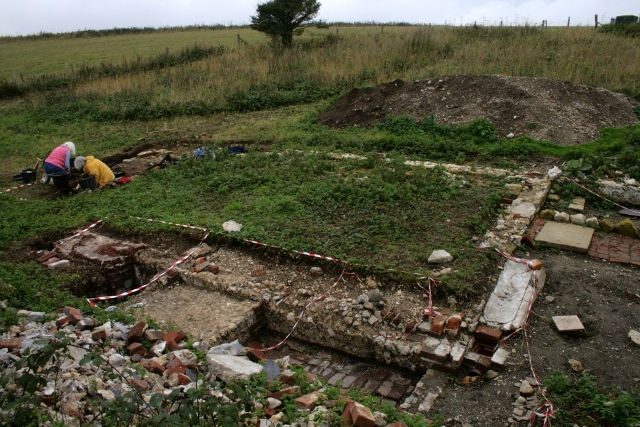 The ground surface inside, to the north, of the wall, as the wall level drops lower, it gains more of the character of the natural orange-brown sub-soil, found at the base of the chalk rubble back fill, which forms the foundation to the cottage’s floor – confirmed where the bulldozer has cut through the existing floor, such as most recently excavated on the north end of the cottage. This suggests we are very close to the bottom of the wall’s foundations. 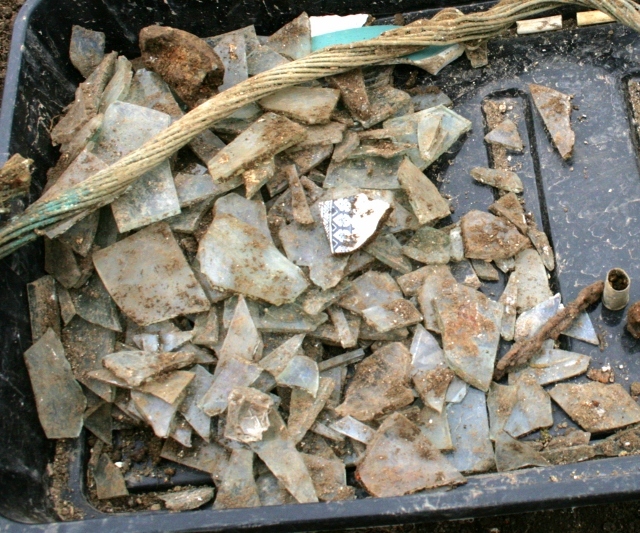 Window glass fragments from area roughly outside NE corner of extension. However, an area – just outside where the extension’s east wall was expected to have been – contained a particularly high concentration of window glass. This indicates that the windows were the first to break and thus landed underneath the cleared demolition rubble. It is also good evidence that a childhood memory was correct, that the extension contained larger windows than that of the original cottage (which was described in 1868 as small windowed). Twisted copper alloy wire handle(?) & other finds. 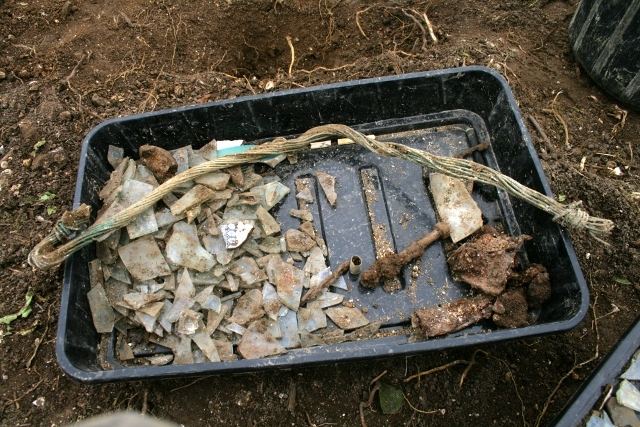 The vast majority of our finds have been from this area to the south of the cottage. Bob Phipps who lived there as a child in the ’30s remembers a well being located here. 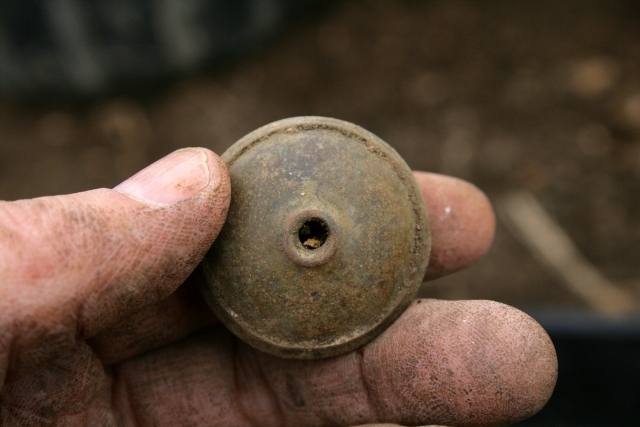 The find of the day was a twisted copper alloy wire handle – could this have been a bucket handle? 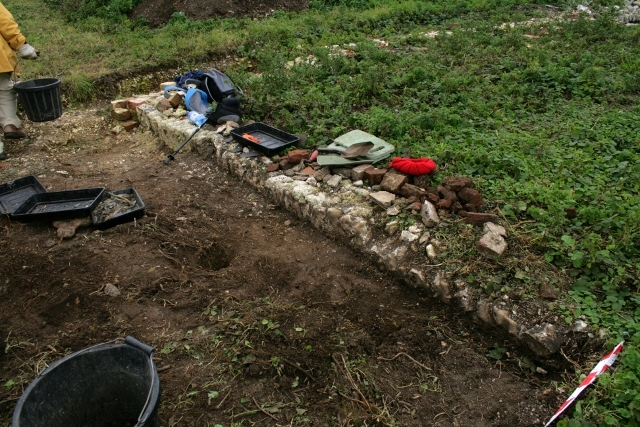 Looking NW at a small hole dug in the trench where an end of the ‘bucket handle’ was found. 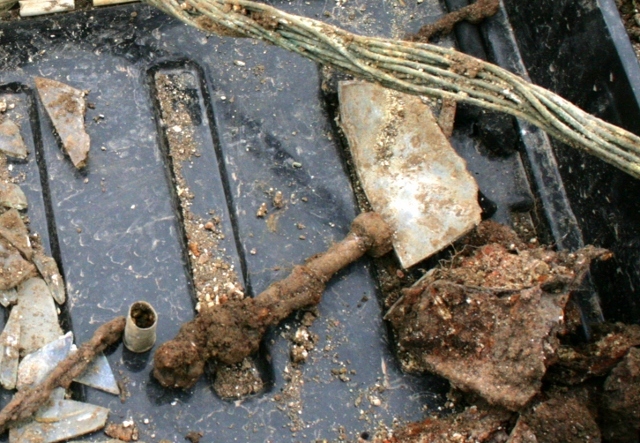 One end was buried about 10cm down in an orange-brown coloured sub-soil fill – shown slighty left of centre in the photo above. It is easy to jump to conclusions and speculate whether we have found a back-filled well. We will just have to keep digging to find out. A find from S of cottage extension. 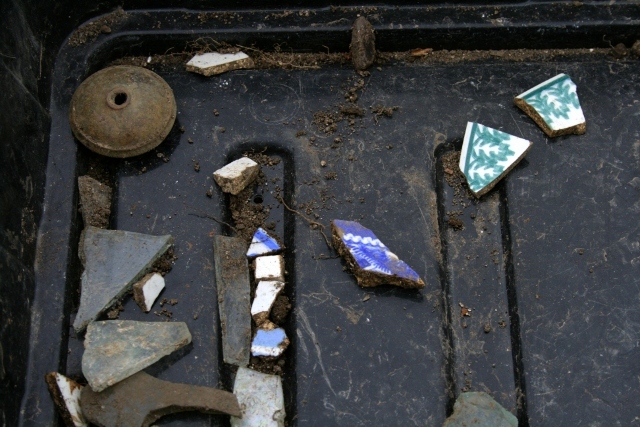 Ceramics were a very few plain and decorated shards, and 2 lengths of pipe stem. Sunday’s forecast was for thunderstorms all day – not good when near the top of a hill – so there will be no digging unless the forecast improves. The long-term forecast for the next couple of weeks is also unsettled, with more rain. So work on-site is now planned to happen whenever there is a dry(-ish) weather forecast and there are people free to dig. 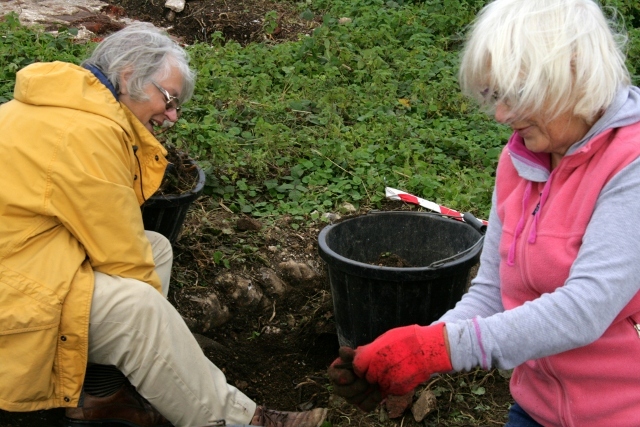 Nevertheless, Sunday – *weather permitting* – we hope to continue digging, and we would love you to join us – no experience required. We meet at the car park near the junction of Bexhill Road and Falmer Road, just north of Woodingdean, at 10am. If thunderstorms are expected we will *not* be offering short site tours!